Comments: It was a nearly perfect day to hike this trail. Much of the day was a bit overcast, and the temperatures were in the 70s. My wife and I had never hiked the Four C Trail before. Our plan was to park at the trailhead at Ratcliff Lake National Recreation Area and hike up the trail for 5 miles and then return by the same path. As we left the trailhead, we were impressed with the amount of work that had gone into building this section of the trail. However, we were glad when the Four C trail split off and left the gravel bed behind. The first 1.5 miles of the trail wind through the northern part of the Recreation Area. There is little undergrowth here. The Tall Pines Trail shares the path with the Four C trail for much of the distance until it finally veers off and heads south back into the campground. 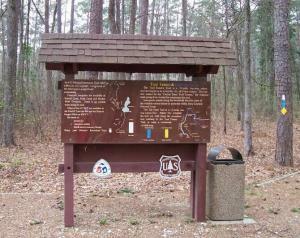 The Four C trail then heads north and crosses Forest Service Road 521. The area between the Forest Service Road and FM 227 had witnessed a prescribed burn only 4 days before, and scattered pillars of smoke still rose from the forest floor. The area north of the FM 227 is much more dense than that on the southern side. The first mile or so of the trail north of the highway follows along an old tramway bed, a survivor of the old logging days of the CCCC. At about the 4 mile mark, we crossed a little logging road that teenagers still use for parties, as evidenced by the pile of beer cans. 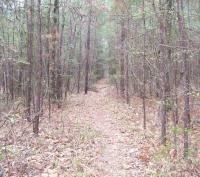 I like this trail and would like to hike its entirety. There are mile markers located at each mile, but unless you are looking for them, they are easy to miss. Instead of lining the trail, they are usually set off the trail 10 to 20 feet, and they are set perpendicular to the trail. Luckily, I had turned backwards to check on my wife at exactly the first mile marker and I spotted the marker by chance; otherwise, I would have missed it. The bridges are in excellent shape, and the trails are well marked with white blazes. The Trail Tamers Trail uses yellow blazes while the Tall Pines Trail uses blue blazes. We took lots of pictures, and I’ve posted some here. One of the hidden jewels of Texas, the Lone Star Hiking Trail is the only long-distance National Recreation Trail in the state. At 128 miles (including loop trails), it is also the state's longest continuously marked and maintained footpath. 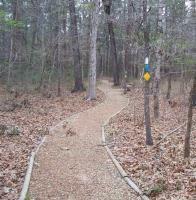 Located in the famed Big Thicket area in east Texas, the trail is well-suited for both short and long hikes (of up to 10 days), appealing to dayhikers, overnight backpackers and long-distance hikers. The LSHT lies between the major metro centers of Houston-Galveston, Dallas-Fort Worth, Austin, and San Antonio--home to more than 8 million people just a 2-hour drive from the trail. The author, a Texas native, is an experienced long-distance hiker who has thru-hiked the Appalachian Trail, the Pacific Crest Trail, and many other nationally recognized long-distance trails throughout the U.S. This is the first guidebook to the trail and is officially endorsed and promoted by the Lone Star Hiking Trail Club.